3 Military Intelligence Battalion (3MI) is an Army Reserve unit under the operational command of 1 Intelligence Surveillance and Reconnaissance Brigade within the Field Army and is based in London and Cambridge. The Painters’ Company has been affiliated with 3MI (formerly Intelligence and Security Group (volunteers)) since 27th April 1967 following its earlier association with a predecessor unit, HQ Army Photographic Intelligence Section (Territorial Army). The Battalion is extremely operationally focused, with a very large number of its officers and soldiers having completed operational deployments. In the past, the Unit has deployed personnel to Kuwait, the Balkans, Sierra Leone, Iraq, most recently to Afghanistan and in support of operations in Libya. They also support deployed personnel working within the London area. When deployed they are completely integrated with and work alongside their Regular Army Intelligence Corps counterparts. The Battalion has four Military Intelligence (MI) companies (Coy). 31 MI Coy is co-located with the Battalion Headquarters in Ashford House Army Reserve Centre on Worship Street, very close to the City. 32 MI Coy is located at Coldham’s Lane Army Reserve Centre in Cambridge and 33 and 34 MI Coys are located in Hampstead, in Edinburgh House on Fitzjohn’s Avenue. 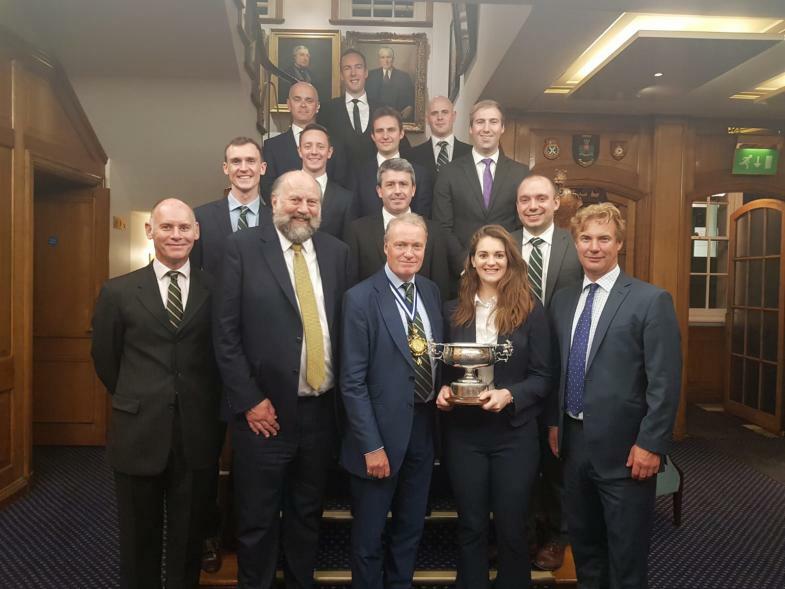 An annual competition of military skills is named the Master’s Company Competition, at the conclusion of which a silver rose bowl (presented to the Battalion by the Company in 1967) is awarded to the winning Company who are then known as The Master’s Company for the subsequent 12 months. The Master's Company for 2018 were 32 MI Coy who were presented with the rose bowl by the Master at Painters' Hall. The Company formed more recently (4th July 1996) an association with the Intelligence Corps, an integral part of the Regular Army. The Painter-Stainers Enterprise Trophy, a handsome piece of silver commissioned by the Company, is awarded annually to a member of the Corps who has shown enterprise not directly related to the profession of intelligence and security, which adds to the moral or social life of the Corps and fosters good public relations. An engraved dress sword presented to the Company by the Colonel Commandant is placed in front of the Master at all formal dinners. The Company formally completed its affiliation with 51 Squadron on 21 September 2010. Originally formed at Thetford, Norfolk, on 15 May 1916 as a Home defence unit equipped with BE2 and BE12 aircraft, the Squadron flew its aircraft on anti-Zeppelin patrols and provided night flying training for newly qualified pilots with Avro 504ks. In June 1919, the Squadron was disbanded at Sutton’s Farm, Hornchurch. The Squadron reformed on 5 March 1937 when 'B' Flight of No 58 Squadron, was renumbered at Driffield. Virginias and Ansons were flown until Whitleys arrived in early 1938, and it was these aircraft that the Squadron flew its first operational missions of the Second World War. The flights took place on the very first night of the War, 3/4 September 1939, and the Squadron dropped leaflets over Germany. Bombing missions started in May 1940, and continued until 1942 when No 51 was assigned to anti-submarine patrols over the Bay of Biscay as part of Coastal Command. The following year Halifaxes replaced the aging Whitleys and the unit returned to Bomber Command as a main force Squadron for the remainder of the European War. The Squadron became part of Transport Command with Stirlings and later Yorks following the end of the European war, transporting men and materials to India and the Far East. The Squadron disbanded in 1950, after taking part in the Berlin Airlift.The Squadron again reformed in the 'Special duties' role when No. 192 Squadron RAF was renumbered at RAF Watton in August 1958, later moving to nearby Wyton. It was only following the end of the Cold War that the signals intelligence role of the Squadron was publicly recognized. Signals intelligence encompasses both Electronic Intelligence (Elint) and Communications Intelligence (Comint). The Squadron flew this role using de Havilland Comets and English Electric Canberras, the former being replaced by a modified version of the Hawker-Siddeley Nimrod, the R1, in 1974. The Canberras were finally retired in 1976. The Squadron has taken part in most operations the British armed forces have been involved with in recent years, including the Falklands War, the first Gulf War, operations in Kosovo and the war in Iraq in 2003. Now based at Waddington, the Squadron continues with its highly specialised surveillance task as part of No 2 Group. Our affiliation with HMS TALENT was established in 2007, a link cemented through the Bond of Friendship between themselves and the Intelligence Corps. The sixth of seven Trafalgar Class SSN submarines, she was launched by her Sponsor, HRH The Princess Royal at Barrow-In-Furness in 1998. Powered by a pressurised water reactor, she is capable of circumnavigating the globe without the requirement to surface and during her first commission completed a total distance of 285,000 nautical miles. HMS TALENT entered a four year Long Overhaul Period in 2002 and undertook significant updates including modifications to the weapons systems, refuel of the reactor core, an entire overhaul of ship’s systems and the introduction of a new cutting edge sonar system. HMS TALENT re-dedicated into the Fleet in October 2006 and returned to the Front Line with a much enhanced operational capability, ready and able to meet the varied commitments of the 21st Century. 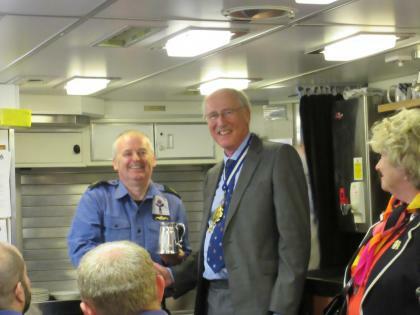 The Man of the Boat receives his award from the Master when he visited HMS TALENT in April 2015.